This article submitted by Linda Stelling on 1/31/01. Tim and Heather Shumaker are the new owners of Pianos Plus. The music store is located at the intersection of Highway 23 and Washburne Avenue in Paynesville. 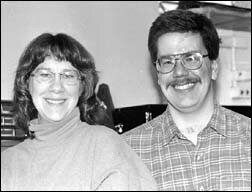 The couple moved to Roscoe in the spring of 1994. Tim received on-the-job training in piano tuning, instrument repair, and sales from Mike Christian, the former owner of Pianos Plus. The couple thought the timing was good for them to purchase the store from Christian. "At this point in time I want to focus my life on the sale and repair of musical instruments," Tim said. "With Mike the focus was on selling, repairing and rebuilding pipe organs. I want to focus more on pianos and band instruments," he added. Christian will continue to sell and repair organs and antiques. Tim and Heather have both taken music lessons since they were young. Tim became involved with music at the age of 10. Heather started piano lessons at the age of four and a half. The Shumakers have secondary instrumental music education degrees from Concordia College in Moorhead. Tim specializes in percussion and low brassÑ tuba and trombone. Heather's emphasis is on piano, woodwind, and percussion instruments. She has a clarinet major. Tim's goal is to provide central Minnesota with the best sales and service of new and used band instruments and pianos. The store will provide sales of band instruments, pianos, digital pianos, guitars, sheet music and accessories, gift items, repair services, and lessons. Pianos Plus is open Mondays through Saturdays from 10 a.m. to 5 p.m. For more information, contact the Shumakers at 320-243-3404.